Dec 1- We went to Denny's that morning to celebrate Sister VanHeels birthday! it was lots of fun :) We always have a blast with these sisters. We then went and did our normal p-day things shopping and cleaning and emailing! We then went and had dinner at the Gibbons home. They were nice and asked about Marc since that is where i went to facetime home. They were very sweet about the whole thing. We then shared our message which is the He is the Gift video that the church has put out! please if you havent seen it yet go and watch it and share it with everyone you know! Dec 2- We were able to have district meeting at the Ridgecrest building which is a different building than we normally attend cause after district meeting we get to practice for the Apple Valley Tree lighting thing the community puts on. They asked us missionaries to sing for about 15 minutes you can say we weren't too thrilled to do this haha we get to sing 5 songs. we hope it goes well! In district meeting Sister Lampinen and I got to do separate trainings. They went really well! according to our district so thats good! We then went and picked up the truck from the elders which we were so grateful for cause it was pouring rain all day! We really didn't want to ride our bikes and the elders were troopers about it too! We went and saw Ann and had a lesson with the Wilcox's and then went to dinner with the Pope's! they are so cute and enjoyed having us over! Sister Pope told us how much we have helped her and mean to her. She is just the cutest! its always nice to hear those words and knowing that you really are making a difference. Dec 3- We were able to have a great lesson with Raquel and Leonard! We taught them about the Gospel of Jesus Christ with the visual. We werent able to get through all of it so we get to finish it next time. They both enjoyed it and participated in the lesson! We then did some Mormon.org time and then went to the Cophers to have a lesson. That was as crazy as always. We then went to a less active, we just got his records so the ward council wanted us to visit with him. he isn't interested in having us come over but he was nice about it. We then went to dinner at the Esplins and had a good time there. After we went and visited with Sister Frank who is super sweet! 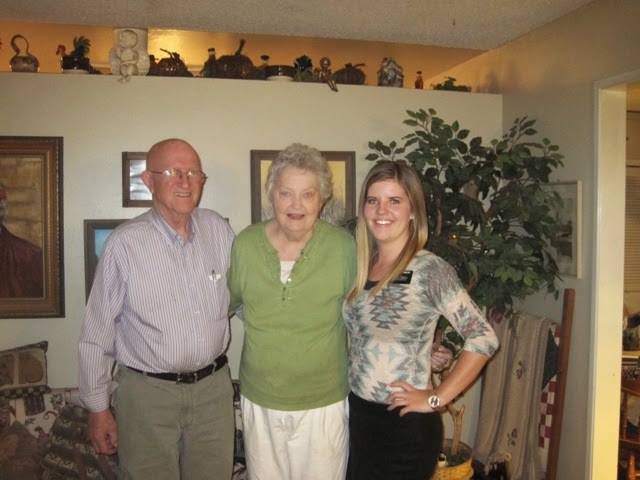 We really enjoyed talking with her and she said she loved having us over and sharing this message with her! She said she needed it that night. Love it when things happen that way! The Lord really does know what we need and when. Dec 4- We were able to go and visit some former investigators this morning and we were able to get a contact of someone who would be interested in learning more! we were excited about that. We then had lunch and went and got the truck from the elders. We then went and had a lesson with Ann which she wasn't doing good at all. it was really short but the spirit was there. we then tried to see other single sisters in the elders area but had no luck! those days are a bit rough but it helps us appreciate the better days for sure! We then had dinner at the Perkins who are such a cute young family! It was so much fun with them. We then went to the RS activity which Sonia was there. A less active we have been trying to work with. it was a super fun night! Dec 5- We had choir practice this morning which went well and we were excited to finally have this done and over with haha we then went home and had lunch and weekly planned. Sister Chapman brought over some Chinese for us for dinner and then we went out and had a lesson with Alberto who is a returning less active! This day was a bit of a hard one for me cause I wanted to be home with my family and support them but I did feel peace and comfort which helped me not want to do anything that day! Dec 6- We were able to do service at the squash farm today. We got to paint the whole time which was fun! We then came home and changed and had to leave to go to the Apple Valley Winter Wonderland event. We were able to sing first and then we went around and passed out bags of cookies that had the He is the Gift pass along cards stapled to them. The church was asked by the city to make about 500 cookies for this event but we ended up with about 1000 and passed them all out! :) we hope people will watch that video and feel the true meaning of Christmas. We had a good time there just talking with people and watching the fun entertainment, we then stayed for the lighting of the tree which a bit of a let down cause the tree was a bit of a sad tree haha but it was still a fun night. we then went to dinner at the Camire's. Well that was my week! i hope you all had a wonderful week! I heard about and saw pictures of the funeral! im so happy it went well!! I love you all so much!! and I know this Christmas season will bring us all peace and love and comfort! 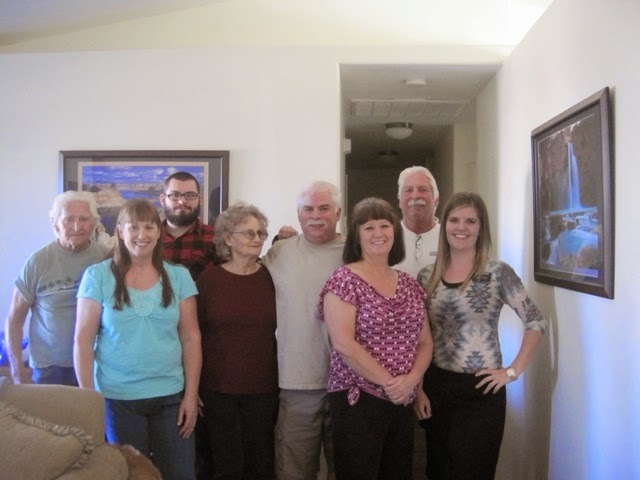 our first thanksgiving meal with Marie and her family who are all non-members. my second meal with the Landers!